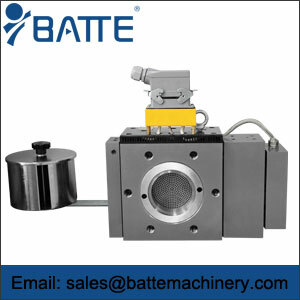 automatic screen changer,belt screen changer - Batte Machinery Zhengzhou Co,.Ltd. How can the automatic screen changer be changed quickly? Zhengzhou Bate Melt Pump Co., Ltd. is an enterprise specialized in producing and selling melt pump, high temperature melt extrusion pump, mesh screen changer, high precision filter and precision control system (PLC). 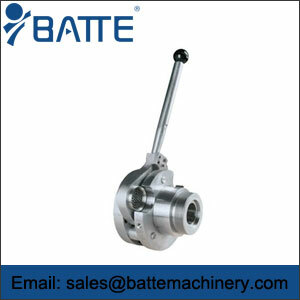 It is one of the earliest enterprises specializing in the production of melt gear pumps and mesh changer. Next, we will explain how the automatic network changer works after installing the automatic network changer on the plastic extruder. 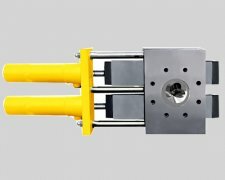 An automatic mesh screen changer is arranged between the end of the barrel of the plastic extruder and the feed pipe of the die head. The base of the automatic mesh screen changer is provided with a conical hole and a through hole intersecting with the conical hole. The conical hole is matched with a conical mesh plate: a through mesh is arranged in the through hole of the mesh plate; a lifting mesh plate is arranged on the base. The device. The lifting bracket plate device includes a bracket, a screw, a handwheel and a pressure plate arranged on the base. One end of the screw matching the bracket is provided with a handwheel, and the other end of the screw matches with one end of the bracket plate with a larger diameter and a pressure plate to form a dynamic fit. 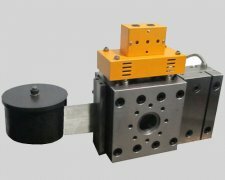 The through holes on the base are step holes, which are connected with the feeding tube on the barrel and die head respectively and are connected with the inner cavity. The angle between the conical hole surface on the base and the vertical direction is 5-30 degrees, and the cross section of the conical hole is quadrilateral.